Early spring has been rightly called the ?rainy season? in the south. In fact, most reservoirs schedule their annual fall drawdown of lake levels in anticipation of rising water levels come spring. Rain in early spring is both good and bad for bass anglers. It is good because the water flowing into lakes and reservoirs is usually warmer and can quickly raise the temperature of any given body of water several degrees in a very short time. This temperature change prompts fish that have been in deeper, warmer water all winter to migrate into shallower water and makes them easier to catch. Heavy rain in early spring is bad because it discolors the water to the point that fish have a difficult time locating lures. The conditions that accompany early spring are what have made spinnerbaits the go-to lure for savvy bass anglers. Let?s look at some of the benefits of using a spinnerbait in spring. Probably the greatest plus for selecting spinnerbaits in early spring is the detectability of the lure. When the water is clear, bass use sight to target their prey, but when the water become murky, fish are forced to use their built-in radar system to locate a potential meal. Bass accomplish this through the use of their lateral line that runs horizontally along each side. The fish?s lateral line is sensitive to even the slightest vibrations in the water and allows the fish to hone in the source of the vibration. Spinnerbaits help anglers in two ways at this time of the year. First, the flash given off by the turning blades of the spinnerbait makes the lure easier to see, and second, the vibrations produced by the blades make it easy for bass to detect the lure even when they can?t see it. With its flashing, rotating, vibrating blades, the spinnerbait not only leaves an easy trail for bass to follow in discolored water, it will even spur lethargic bass into aggressive strikes in the process. Another major plus associated with spinnerbaits in early spring is the various ways they can be fished. Spinnerbaits can be fished shallow or deep, fast or slow, in and around cover, or in open water. In fact, there are few places that you can?t fish a spinnerbait. When early-spring bass are related to cover such as treetops or stumps, a deadly technique is to cast the spinnerbait past the target and then slowly roll it into the cover. Once the spinnerbait makes contact with the cover, let it bump and fall into the cover and slowly roll the lure over and around as much structure as possible. This technique has at least three primary bass-enticing ingredients. First, the bumping of the spinnerbait into the structure is an attention-getter; the more bumping the better. Second, the fluttering fall simulates injured forage and is especially tempting to those lazy, cover-hugging bass that are reluctant to chase your presentation. And finally, the change of blade direction created when the bait?s fall is stopped and is slowly lifted and rolled upward over the limbs, is often the trigger that will turn ?watching? bass into "attacking? bass. Spinnerbaits are also effective on bass that have moved up on gravel flats in anticipation of the spawn. Often these flats are void of cover. Fish in these areas will relate to the bottom, and the best approach is to S-L-O-W-L-Y swim the spinnerbait along the contour of the bottom all the way out to where the flat drops into deeper water. A slow retrieve that is just fast enough to keep the bait slightly off the bottom and the blades turning seems to be the most effective technique. 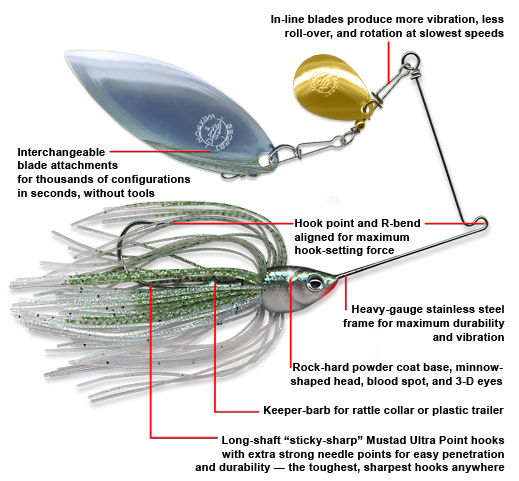 No column on spinnerbaits would be complete without saying something about blade style, size, color, and combinations. Basically there are three types of blades: the Colorado, the Indiana, and the willow leaf. The Colorado blade is the most rounded and cupped of the three, displaces the most water, produces the most vibration, and can be retrieved slower. The willow leaf blade produces the least vibration, throws the most flash, can be fished the fastest, and best simulates the shape of baitfish. The Indiana blade is teardrop shaped and falls in the middle in regard to flash, vibration, and speed in relation to the other two blades. As far as color selection, generally a gold, florescent red, chartreuse, or copper-colored blade is used in stained water; gold is good on a cloudy day in clear water; and a silver blade is used on sunny days in clear water. There are obviously times when anglers need spinnerbaits rigged with combinations of different blades styles, colors, and sizes for different applications. One of the best solutions I have found are the spinnerbaits designed by Secret Weapon Lures that offer quick-change kits in both the Quick Strike and Side Arm models. You can view the endless spinnerbait combination possibilities by visiting their web site at //www.secretweaponlures.com/index.htm. Spring is a time of transition and calls for varying techniques because of rapidly changing water conditions. No lure meets the challenges of this period like the spinnerbait.